For 6,000 years, two young lovers have been locked in an eternal embrace, hidden from the eyes of the world. This past weekend, the Lovers of Valdaro  named for the little village near Mantua, in northern Italy, where they were first discovered  were seen by the public for the first time. 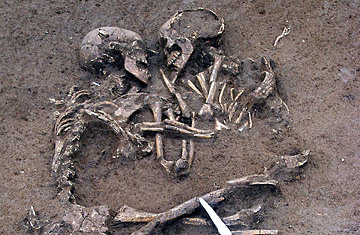 The lovers are in fact two human skeletons, dating back to the Neolithic era; they were found in a necropolis in the nearby village of Valdaro in 2007, huddled close together, face to face, their arms and legs entwined. They were displayed this past weekend at the entrance of Mantua's Archaeological Museum, thanks to the effort of the association Lovers in Mantua, which is seeking a permanent home for the ancient couple. After the discovery, many thought that the couple had been killed. It would fit in well with the history of an Italian region famous for many tragic love stories. Mantua is the city where Romeo was exiled and was told that his Juliet was dead. The composer Giuseppe Verdi chose it as the location for his opera Rigoletto, another story of star-crossed love and death. But subsequent research revealed that the skeletons did not have any signs of a violent death. They were a woman and a man, ages between 18 and 20 years old. Some have wondered if they died together, holding each other in a freezing night. Professor Silvia Bagnoli, the president of the association Lovers in Mantua, doesn't exclude this possibility, but she says that more likely the skeletons were laid out in that position after their deaths. The mystery might never be solved. Still, many want to see the couple. The association Lovers in Mantua is campaigning for their right to have a room of their own. According to Bagnoli, €250,000 will be enough for an exhibition center and another €200,000 could pay for a multimedia space to tell the world the mysterious story of these prehistoric lovers. Read more from La Stampa in Italian. See TIME's video on recreating dinosaurs on the museum floor. Read about a new hominid skeleton found in South Africa.